In embryonic development, pure cartilage structures are in the basis of bone-cartilage interfaces. Despite this fact, the mature bone and cartilage structures can vary greatly in composition and function. Nevertheless, they collaborate in the osteochondral region to create a smooth transition zone that supports the movements and forces resulting from the daily activities. In this sense, all the hierarchical organization is involved in the maintenance and reestablishment of the equilibrium in case of damage. Therefore, this interface has attracted a great deal of interest in order to understand the mechanisms of regeneration or disease progression in osteoarthritis. With that purpose, in vitro tissue models (either static or dynamic) have been studied. Static in vitro tissue models include monocultures, co-cultures, 3D cultures, and ex vivo cultures, mostly cultivated in flat surfaces, while dynamic models involve the use of bioreactors and microfluidic systems. The latter have emerged as alternatives to study the cellular interactions in a more authentic manner over some disadvantages of the static models. 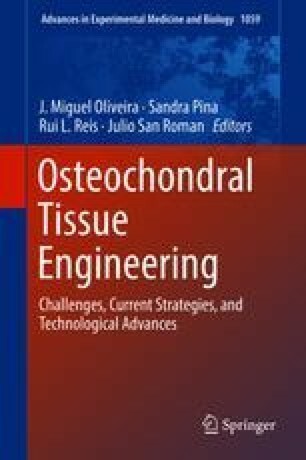 The current alternatives of in vitro mimetic models for bone-cartilage interface regeneration are overviewed and discussed herein. The research leading to this work has received funding from the Portuguese Foundation for Science and Technology for the M-ERA.NET/0001/2014 project and for the funds provided under the program Investigador FCT 2012 and 2015 (IF/00423/2012 and IF/01285/2015).